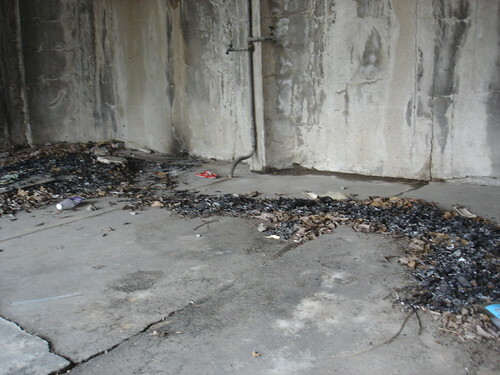 Burned debris & garage, which the fire department put out on their second visit., originally uploaded by chrisfreeland2002. As we pulled into the alley they approached our car and started banging on our windows, saying "Sir, sir, roll your window down." We did not, and pulled ahead and parked our car behind our house. We went to put out the fire behind 3219 Magnolia, and the kids were already out of sight. We walked around the front of 3219 Magnolia and informed the residents that there had been a fire behind their garage. They called the police. We walked back to the alley and saw that there were several small fires burning in the alley behind the 3100 block of Magnolia, specifically a large one behind 3145 Magnolia. We called 911 and reported that 2 kids were setting fires along Magnolia and S Compton. We were transferred to the fire department and reported the same to them. We called our other neighbors along S Compton and told them to check & make sure there were no fires burning behind their houses or garages. The fire truck showed up 5 minutes later and as they approached I pointed to the one fire that was still burning in the alley (the rest had burned out). The firemen got out of the truck, unspooled the hose, and put out the fire. They then got back into the truck and drove off, all while I was standing right there, waiting for them to do their job before I interrupted and told them about the series of fires. I never got the chance to give them any information because they never made any eye contact with me, had a general attitude of being inconvenienced by such a small fire, and promptly drove off. I walked over to the fire that they put out, which was behind an open garage at 3145 Magnolia, and noticed that the garage was on fire. They had put out the small fire behind the garage, but had left the garage itself burning. I once again called 911 and reported the garage fire. When the same truck and crew showed up the second time I pointed out the fire, then went to make sure that there were no other fires burning in the alleys between Virginia & Michigan, which is what I had expected the fire department to do in the first place! The fire truck stayed on the scene until the police arrived and I reported the gas-soaked mattress in the alley. I was told to report it to CSB, and that we'd probably have to wait until the next bulk trash day before anything was taken away. The police arrived and we made a report. I have great respect for the fire department and police, and worked with both during my tenure as president of this neighborhood association. That said, I have never been treated so dismissively over something as serious as multiple fires set by juveniles near my home. If we had not continued checking into the fire at 3145 Magnolia it's likely that more of the garage would have burned. I guess we're lucky this happened in spring and that there's been a lot of rain lately. I am well aware that this is a minor incident in the grand scheme of things, and that vandalism like this is not unusual in our city. However, I refuse to accept that I had to walk the blocks last night to ensure more fires weren't being set after the fire department left the first time, and that the fire department did not do a thorough or even satisfactory job in the first place. This morning I was encouraged when I saw Refuse hauling away the mattress and other bulky trash. As I was out taking pictures and surveying the damage I noticed that there is also a newly broken window along the side of 2715 S Compton, where we had initial contact with the kids. I don't think it takes much to assume they did it.